This is not a joke. Not even hyperbole. It’s science – about as sciency as it gets. And it’s a powerful natural ADD remedy of sorts. Fact is, research shows that at least two things happen physiologically when this pose is struck and held for two minutes: stress goes down (cortisol reduction) and confidence and clarity go up (testosterone bump – yes, even for the ladies…in a good way). Featured in a fascinating TED Talk, Dr. Amy Cuddy’s research on body language shows how we can change our own body chemistry — and even other people’s perceptions of us — just by changing our body position. Posture not only can alter our emotions, it can affect how confidently we approach situations and solve problems, which in turn affects how powerful we appear to others. In other words, power poses like the one above (a few others have been identified) not only result in greater self-confidence, they increase the confidence others have in us. And here’s a kicker: We positively influence our own mood and the perception of others when we’re happy and smiley. Even when we force a smile (like, by holding a pen in our teeth). 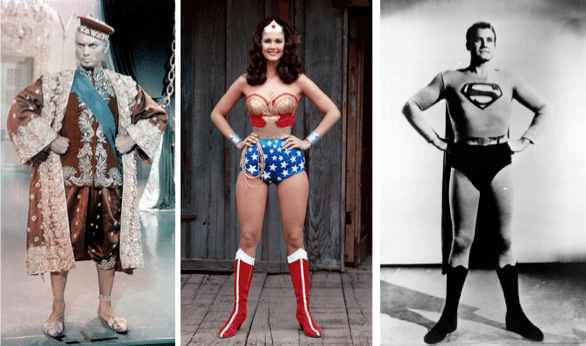 So you might say that, to feel happy or powerful, you can “fake it ‘til you make it” with power poses…and power smiles. Help recovering alcoholics from relapsing. Help subjects take the initiative and take risks. Bottom line, expansive poses can re-set your weary mind, improve mental performance and positively affect how you’re perceived. And the physiological change lasts for 15 to 20 minutes – or longer. Hmmmm. Sound like something that might help an ADDer? I do it all the time. And it @#$@&! works. So give it a go and crush it, you Wonder Woman/Superman/King of Siam! LOL! That’s great Tom! Think I will, too! The higher the building, the better! Just remember that with hands firmly on hips, you can’t really hang on to anything. Careful! Hi, I have a question. Im adhder and married to an non adhder. Things we agree, how to manege certain communicationproblems and also behavior Problems, I never improof, and I feel, I dont have any chance to improove, i feel like im blind, and those thing are moving around in the room, if im lucky, once in a while i catch one, but may just for one time.. Do you understand, what I mean? I dont know if its about the same topic, but, one person one time told me; I dont know what is your problem, but you dont put in practice the councels. Do you know what my problem is, and what I can do about it? Hi Carla, I definitely understand. You have described ADHD in very familiar terms. Don’t give up on yourself — you CAN improve. Keep learning and trying new things. Start with a healthy diet (low sugar/carbs, high protein) and if you have not been formally diagnosed, make sure you get that diagnosis and possible treatment with meds, if that is a possibility. Just as importantly, try ONE new strategy at a time, until it becomes a habit. 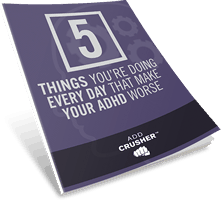 Too many ADHD adults get excited about 15 different strategies and then actually DO zero of them. Wishing you best luck in your journey! Hey, firstly thank you so much for ADD Crusher, it has seriously impacted my life and given me hope that I can be a success in this world that I find so very difficult to operate in. My question is about responsibility of my actions. Quite often I will do or avoid doing something subconsciously or impulsively and it feels like for that split second when I took that action that it was not in my control and almost immediately after I regret it. In the same scenario when my impulsive or subconscious action effects someone else and they are either angry or disappointed in my actions, I find it VERY difficult to accept responsibility for it. The reason I find it so hard is because I generally agree it was the wrong action to take and most importantly I feel like it isn’t fair to blame me for it because I don’t feel I had control over the action I took. It literally feels like I’m unfairly having to take responsibility for the actions of someone else (Mr ADD). So in this scenario I feel I have two choices 1) accept responsibility, have this person think less of me, lose faith in myself that I am able to make the right decisions, take a hit to my self confidence and feel even more frustrated with ADD continually making me feel like the idiot I know I’m not. or 2) Get defensive, make an excuse up on the spot, hope that the other person believes me or can see sense in my explanation but as a consequence, feel terrible for lying, losing confidence in myself and after the same scenario is repeated with the same person, have them feel frustrated and upset with me for ‘never’ taking responsibility for my actions, lying to them and feeling like they can’t trust me. So my question is how can I best handle this scenario. It has effected my career, my friendships, relationships and in my 40 years has created a reputation that I feel is not true to who I really am. I would really appreciate your help if you have a solution, because although I believe we have to take responsibility for our actions as a person with ADD, in doing so it has such a negative effect on self confidence and faith in a successful future. Thanks for the kind words and glad ADD Crusher is helping in your journey (you left a wonderful quote — would love to share it, with your OK…first name only). You post a powerful and classic question. The short answer to the dilemma of “do i beat myself up or do i let myself off the hook for impulsive mistakes that hurt others?”…is to listen to your heart. 1. You don’t deserve to be beaten up by yourself. 2. You’re too good a guy to NOT be taking responsibility for ALL your actions. And the longer answer is, ya gotta take responsibility for ALL your actions, which is NOT the same as beating yourself up. It means admitting, apologizing and working to do better next time out. And clearly you’ve entered the battle toward working to do better. Your very positing of the question is an advance on the enemy, Mr. Status Quo. Keep questioning. Keep observing your impact on others (and yourself). And keep working to crush your weaknesses so your strengths can shine through and carry you forward. Sound’s a little like a pep talk as I proofread it, but it ain’t. Straight from the gut to the keyboard. Hope it sheds a little light. I’m chuffed to get a reply from you. Before I discovered ADDCrusher, Tony Robbins was one of my only inspirations. Your story and what you have created has inspired me to keep trying and I really thank you for that. Thanks for your advice. I guess there really is no way of escaping responsibility for my actions, despite the frustrations of ADD. I’m hoping with the support of ADDCrusher I can turn things around, reach my potential and finally get things right. One bit of information that I know would really help me is ‘success stories’ of people similar to yourself who have overcome the obstacles and made a real success of their lives after being diagnosed with ADD. Perhaps some of your members? It would be great to hear their story’s to help inspire and believe that you can have ADD and realise your dreams. 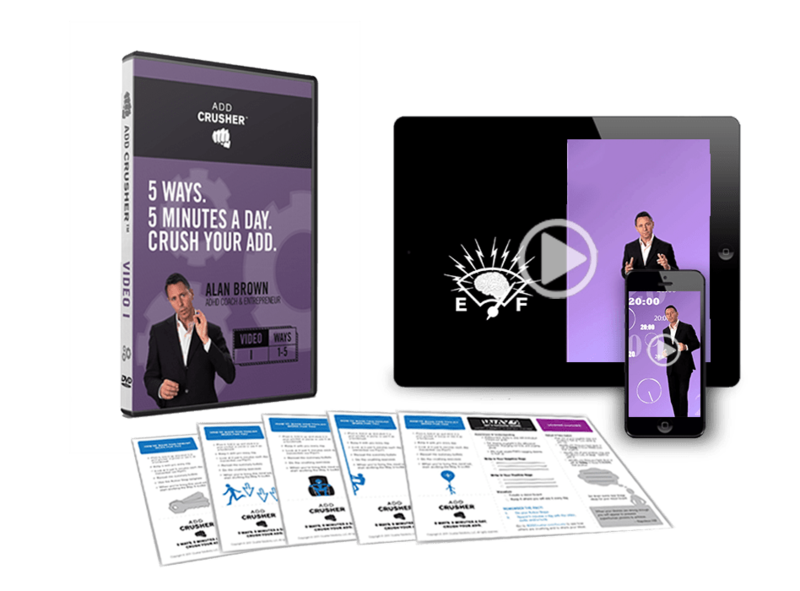 As a member of ADDCrusher, please feel free to email me direct and I will confirm my testimonial for your use. Thank you again for your reply, it means a lot. I’m chuffed that you’re chuffed, and doubly chuffed to now know the meaning of “chuffed”! And thanks again for kind words. There are lots of ADHD success stories — a book by ADHD coach Judy Brenis called ADHD Heroes tells about 15 great stories (she told my story among them). But go to our Resources link and Articles — at the top of that page is a link to a wonderful article called “ADD in the Corner Office”. Inspiring stories of a few top business leaders challenged by ADHD and/or other LD’s. Of course, sooner or later you’ll be your own hero, I suspect. Hi there. I’m a new but very big fan. Almost enough of an addict to make a purchase, so string me along here why don’t you. I would love to see more articles about time management. I know it falls under procrastination, getting things done, etcetera that you write a lot about but I’m thinking very specific articles about being on time: knowing that it takes time to travel and not waiting until it’s time to be there before leaving.! Thanks. Time management does have multiple aspects. As you mention, procrastination is a biggie. There’s also genera sense of time reality, to which you allude. And solutions range from crushing procrastination to purchasing time management technologies. Hey Alan – I really appreciated this post and just tried it out ahead of a presentation I have this afternoon. Look, I would really like to see some material on “tricking” my adhd brain to get creative and focus on big projects that require creative thinking. My experience of creativity is that it almost happens passively in the background of my mind while I am doing a completely unrelated task. When I go back to the project that the creative thought was directly related to, I have either lost the thought, or simply can’t think of the next step. It is a kind of distracted intuition going on behind the scenes, but it is damn slippery, like an eel. Any input would be great. I love your style and I love your advice. All of it is golden. Thanks for the kind words. You’re touching on an absolutely KEY area for us ADDers, because our louse short-term memory (working memory) and synaptic creative spark are often at odds. Just as you describe, you get creative ideas in the background (synaptic thoughts triggered by something loosely related), but then it’s lost when trying to return to it. A dilemma because creativity is supposed to be one of our saving graces, but if our crappy memory is evaporating our creative thoughts….@#$%#@!! 2. The obvious, sort of…Keep a sticky pad or your smart phone with you at all times to record sparkly ideas. The very act of writing them down or typing them in helps secure them. 3. Know that the really GOOD creative ideas will have more salience. So the harder an idea/concept was to remember, the more likely it was half-baked or not that strong to begin with (yes, I know, they ALL seem so awesome when we first think of them!). I’ll close by reiterating what I teach in Way 3: Shut-up-a-You-Mind — the quieter your mind, the more widely opens the window to creativity. I heard you speak last night at the Zen Brain Hacks Lecture that you gave. I thoroughly enjoyed your style and charisma. It was the first time that I felt so at home in a room full of add’rs. Actually there should have been a waiting line, you were that good! I already put to use your hack of clearing off your desk – I did that last night when I got home from your lecture – I had an amazing day. It started at 5:30 am with a safety meeting downtown. Actually its been so mystical my path. I have already been on course to relieve my stress with nutrition – I’ve been going to an acupuncturist and changed my whole eating regime. No sugar, white food products, alcohol, caffeine, meat or fish – I actually wanted to give it a go for three years (I did one month A+, felt like a million bucks, and went off a bit in the sugar dept and, meat dept, but completely overhauled my eating habits 360, so I can attest to the benefit of this hack! Another book is called The Stress Pandamic by Paul Hujuich. I came across his book at a Nami Convention. His book has literally been such a positive reinforcement for a healthy lifestyle – which has also helped my ADD. Basically, I felt like I was going to have a nervous breakdown – and I took the bull by the horn and needed to take some serious action – Your techniques are the “bomb” thank you! Oh and there is something else – the “Carlin Stuff” episode was great. There is another one online – called The Story of Stuff on tube — I think that it will be a nice add to your resources – Its about 20 min. though, but well worth watching. Also, I just purchased The Planner and started it today. It’s also a nice little product that has been very beneficial – its a filter down method, where you write all your stuff that you need to do at the top, with categories that you customize and then there is a place for you to put your appts for the week, your expenses, your notes, so that you can start to work on your goals – I’m not explaining it very well, but it’s worth checking out on line as well, and there are blogs from others who have adopted it and speak about how they use the system. ps – I’m going to spread the word about your lecture coming up! I had read this somewhere before and I have tried it. No fireworks, but it’s a good idea just to do some mindfulness before tackling a challenge. It’s so, so big. I’m on a racetrack today (motorcycle racing) and talking to an entrepreneur who works (and races) all over the world and we were talking about the power of mindfulness when you are on a racetrack (it keeps you alive!!) and when you are sitting down to work (it keeps your BRAIN alive!). Keep thinking about your thinking!